MANKATO, Minn. (AP) — A southern Minnesota college student’s spoof video of an apparently tumorous rabbit that he dubbed “Frankenstein” has attracted hundreds of thousands of Internet viewers. In the video, entitled “The World’s Scariest Rabbit,” Boettcher speaks in an Australian accent, imitating the late crocodile hunter Steve Irwin. Boettcher last saw the rabbit Wednesday night. He thinks it might have a papilloma virus that’s a form of cancer. Joe Stangel, area wildlife supervisor for the state Department Natural Resources, said he also suspects that is what it is but is waiting for confirmation from a veterinarian. 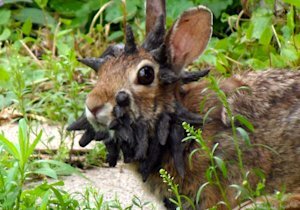 It’s not an uncommon ailment in rabbits, Stangel said, but he’s not seen it on the top of the head. It’s generally a fatal ailment, Stangel said, noting the DNR would just let nature take its course. Some of the video comments haven’t been particularly kind to Boettcher. Some say it’s wrong to get a few laughs from a disease that certainly will kill the animal. Others say he has a responsibility to get it some veterinary help.